Experience all of the reasons you've come to rely on Minster. While the Minster reputation is certainly founded on our press capabilities, the Nidec Minster family offers full-service press room solutions. Whether your need is a unique press, robotic or automation integration or a complete operational line setup, our product offering has been created with you in mind. In fact, our partner brands are pre-selected to meet the same high standards we expect of our own products, so that when you work with Minster, you can be assured that you are receiving the best solution to your need. We are ready to help you achieve your goals. View our product offering menu below to learn more. Full tonnage capacity for contract stamping, high speed applications, container packaging and more. Nidec Minster’s Robotics Systems team is committed to supplying our customer with the best product AND the best experience. When a customer purchases equipment, they are making a long term investment in their business. When Nidec Minster sells equipment, they are investing in a long term relationship with a customer. This mutual interest is the cornerstone of Nidec Minster’s 120 years of engineering and customer service experience. The Robotics Industries Association (RIA) has recognized the Nidec Minster as a certified robot system integrator. Established in 2012, the RIA Certified Robot Integrator Program provides robot integrators with a way to benchmark against industry best practices and allows robot users to develop a baseline for evaluating robot integrators. In order to become certified, integrators go through a rigorous process which includes an on-site audit, safety training and hands-on testing of key personnel among other important criteria. System upgrades, retrofits and new product integration are all part of our competitive offering. Ancillary products that enhance the productivity, safety and performance of your existing metal forming equipment. 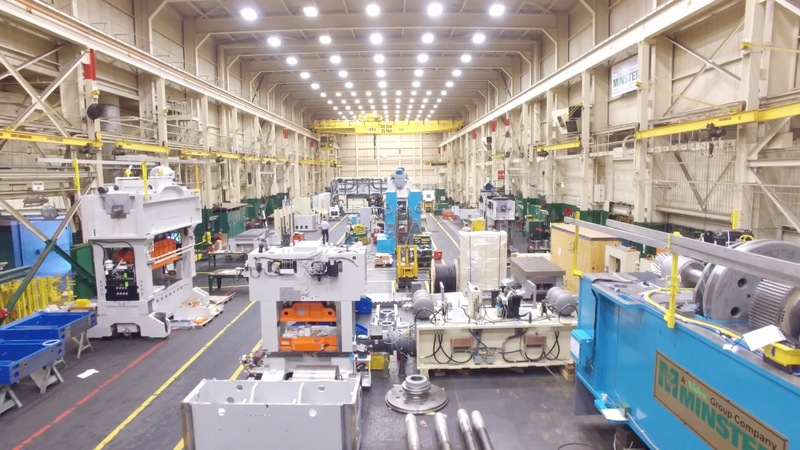 Immediate and short term delivery is now available from Nidec Minster Corporation for complete press lines, coil lines and components, and presses. Nidec Minster has developed a stock program to help meet the requirements of our customers with shorter delivery needs. Nidec Minster has many models in standard sizes currently available. For information about any of the available equipment contact Nidec Minster direct at +1(419) 628-2331 or sales@minster.com.